The UK DT VII ARC (only 100 done). This, as far as I know, is the only one that is signed. I have Dolan to thank for that!!! Looks like you firgured out the pic posting too. I've moved the remarques posted by Wiz and John into a new thread. They deserve to be highlighted. This is my 1st Edition US Carrie and the earliest signature of any book I own. OK, last picture for the day....a couple of New Lieutenant's Rap (s) and a Cycle of the Werewolf Portfolio (matching number with the book). I have all 3 states of the Rap--Signed and numbered, numbered proof (1 of 24) and unnumbered proof. Man, I want one of those Lt.'s Rap books! With the necklace, of course. This is amazing. I mean, wow--30 years. Hi all. I'm not a collector of books so I have a question for you all. Why do I see multiple copies of some? Is each one different and more valuable than the others? I'm curious. I love the pictures you guys have posted though. HA! I asked that very same question myself once! These guys here put up with me invading their forum (a similar one in a different place) a while back and asking ALL kinds of silly questions. Very patiently. I think they are a great bunch of nutty collectors!!! There are various reasons for multiple copies of some books. Let me address the DT series first and I will lay this out very simply and there is no intent to insult anyone's intelligence. The DT publisher Grant, issued each hardcover of the series in different states, a Signed/Lettered edition (signed by King and artist), a Signed numbered edition (signed by King and artist), a regular trade edition, and in the case of the last 3 books, an Artists edition (signed only by the artist). Some collectors like myself desire all states of the book for their collection. Also, with the DT series, the holy grail is to own a complete set of S/L editions all with the same number. While I could expound further, I think this gives you a rough idea as to why multiple copies are owned. Also, some of us own, let's say a regular 1st edition of The Talisman, but also own another copy signed by King, or another copy signed by Straub, or even one signed by both. As you can gather, there are lots of various combinations. I hope that goes a ways to answering your question. We love questions here, so keep asking away!! Thank you very much for your answer wizardsrainbow! I can see how a collection could build up. I have a UK trade edition, first edition first printing, of Lisey's Story. I also have the another copy signed by King, and I also have a third printing signed by King. Somehow, though, I ended up with yet another first/first that I use as my reading copy. I also have a copy of the Lisey's Story proof that is numbered 78 of 100 in a cardboard slipcase , another proof without a slipcase numbered 187 and a copy of the proof dust jacket that is different than the one used. A picture of this is attached. This is the regular UK trade edition. GREAT stuff so far!!! RF, I have loved your collection since I first saw the pics!!! Impressive!!!!! Beautiful!!! Towerguard, you're well on your way!!! One piece at a time...that's how I've been building my modest collection. Wiz, it's great to see yours too! The DT books are a grail to me too and someday, I'll own my first S/L. I can't wait!!! I'll get some recent pictures of my collections up this afternoon. I love this thread (I spent hours going through the .net thread when I first joined!). Oh, and I know first-hand that these collectors have THE biggest hearts!!! You all know who you are when I say "Thanks." Wow! Look at all of the dust covers that could be thrown away and pages to be dog eared. Seriously, these collections are fantastic. Seriously, this stuff is really amazing guys. I thought I was doing good with trying to get all his novels in hardback on my small little bookshelf. You guys have really piqued my interest in branching out into King collecting. 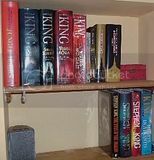 Here is my little bookshelf of King's books. 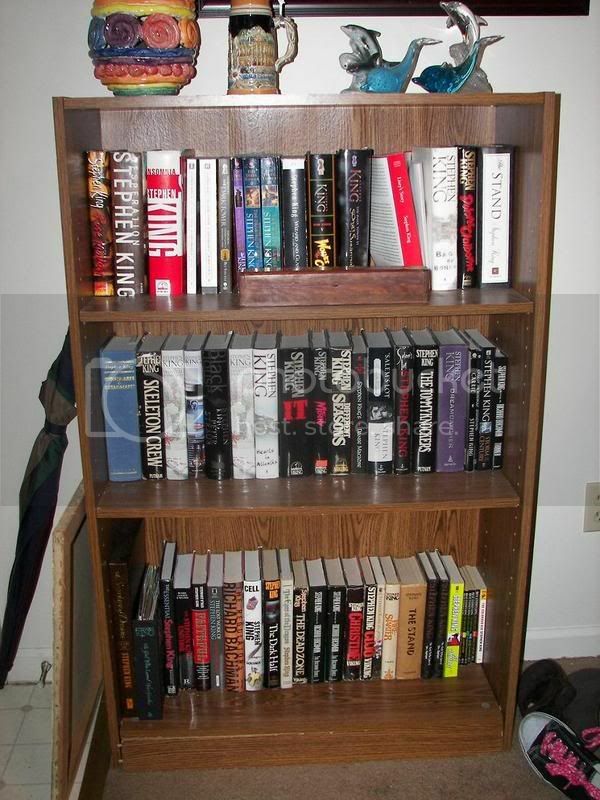 I have about 3 boxes in my closet as well filled with my old paperbacks of his. I guess the most "valuable" thing I have would be my Secretary of Dreams I got from Cemetary Dance (bottom shelf on the far left) and I do have an ARC of Lisey's Story (top shelf near the right). There's already some really great pictures up here and I love to see what everyone else has, so keep 'em coming everyone! I have a whole load of photos uploaded to photobucket. I spent some time organising them today and making slideshows so here I go at trying to get them up here. I tell a lie, there are 6..
Last edited by The Red Rose; 05-22-2007 at 03:12 PM. Reason: Just tidying up a little, cool that you can add more than one URL to a post! The DT publisher Grant, issued each hardcover of the series in different states, a Signed/Lettered edition (signed by King and artist), a Signed numbered edition (signed by King and artist), a regular trade edition, and in the case of the last 3 books, an Artists edition (signed only by the artist). Some collectors like myself desire all states of the book for their collection. Are you sure there is a Signed/Lettered edition for each of the seven DT books published by Grant? I've only heard of a lettered edition for DT1: The Gunslinger. DT1 Gunslinger was issued by Grant with 500 numbered signed copies, 35 lettered copies, 12 Publisher's copies, 40 Author's copies and 10 Artist's copies. This information is in Beahm's Stephen King Collectibles. 10,000 Trade first edtion first printings were done. A second printing of 10,000 was done a while later. 11,000 third printings were issued as part of the Dark Tower Gift Set (along with a second printing of DTII and a first printing of DTIII in a slipcase.) The lettered Gunslinger goes at least around $10k if you can find one. I've never seen any of the other special copies. The signed numbered DTI goes in the $4-7k range.